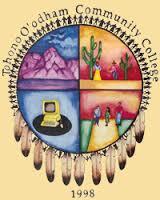 Tohono O̠odham Community College (TOCC) is a two-year college for individuals from all walks of life who want to further their education. TOCC primarily serves the residents of the Tohono O̠odham Nation, but anyone pursuing a higher education is welcome to attend.Despite its short history, TOCC has grown into a vibrant educational center, offering numerous degrees, certificates, and other credentials. The curriculum is designed to help individuals fulfill their educational dreams and to create a stronger, better-trained work force for the Tohono O̠odham Nation. Courses are arranged to complement classes at both Pima Community College and the University of Arizona. Highway 86 Mile Post 125.5.